Learn the importance of collaboration. We have an exercise called the Australian Trolley where a group needs to coordinate moving a pair of two by four beams. It looks simple to do but is hard to coordinate and it takes collaboration. Successful teams communicate up and down the line about the goal (getting to an end point) and how to execute a plan (working in unison to move the boards in an alternating fashion). Another exercise we use is called Bull Ring where anywhere from 8 to 15 people must raise a ball that is balancing on a metal ring with strings and move it to another resting place. This requires clear communication, someone taking the lead, and accepting different points, as depending on where you in the circle, the task looks different. As in the real word, we sometimes add complexities (needing to change positions on the Australian Trolley or blindfolding some of the team members during Bull Ring) to mimic constraints and on the fly problems that come up in real life. Openness to different points of view as individuals bring different strengths and perspectives to solving a problem. The incentives of the group are aligned so that everyone benefits from success. 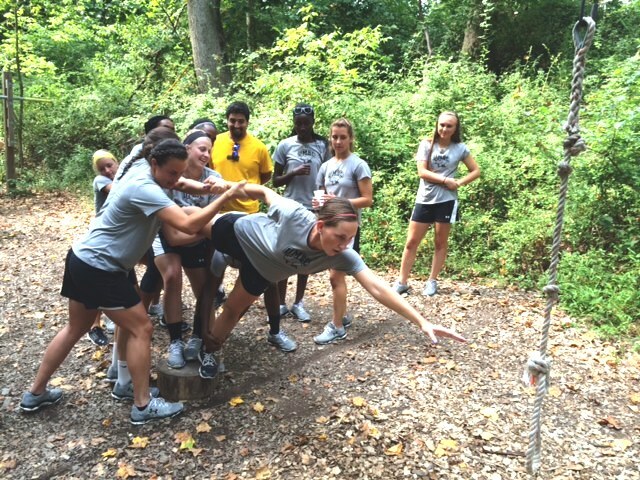 Terrapin Adventures does team building year-round to help foster better collaboration. We can run programs inside and outdoors, at your location as well as our own at Savage Mill. If you have any questions about Collaboration and Team Building, please call Terrapin Adventures at 301.725.1313, email us at info@terrapinadventures.com, or fill out the contact form on our website. You can also follow Terrapin Adventures us on Facebook, Twitter, LinkedIn, YouTube, Google+, and Pinterest for up-to-date information on events, trends, and other fun and exciting outdoor activities. This entry was posted on Saturday, February 26th, 2011 at 6:32 pm. Both comments and pings are currently closed.